Of greatest importance, I regard Jim as one of the most honorable people I have ever met." "Jim Powell has the best financial newsletter, bar none." "Thanks, Jim. Knowing what's coming in advance is paying for my subscription many times over." "I looked over my notes from the meeting last November and was very impressed by your performance on the stocks you suggested. Out of the twenty stocks you suggested, two are up 10%, five have doubled, two have tripled, and one is down slightly." "Your advice is more and more appropriate – and, of course, was given well in advance of even the most trusted press. Keep that [crystal] ball polished and safe." "It is a shame that all small businesses and entrepreneurs do not subscribe." "I have built a portfolio from your recommendations. The appreciation has exceeded both Standard and Poor's and the Dow." "Some people write to their favorite baseball players, movie stars, or to Santa Claus. I wanted to write to my favorite stock picker. You have been a valuable resource and a trusted advisor for years. I would love for that to continue in some form or fashion." "I am a subscriber since 1987 and I followed your recommendations with success (sic) and profit. I read that you are making clients tours and I hope you will extend these tours also to Europe, where you will have undoubtly (sic) also friends and specially to my country. In advance I give you a cordial welcome here. You are a prudent and honest adviser and I should like to continue with reading your writings. If you can do that, which fee you intend to let me pay?" "I just subscribed for the first time in October and after reading your archives I was most impressed at your accuracy. Thank you for your time, advice and brilliant newsletters." "James Powell has done a great job of identifying those sectors that investors should focus their attention on for growth in the coming decade." "Jim has captured the essence of the important trends affecting our world and investments in a highly readable and readily understandable style. He provides just the right balance between broad-brush overview and specific details to make this book both interesting and potentially profitable." "You must realize after getting your newsletter for several years now that you have become a part of our family. 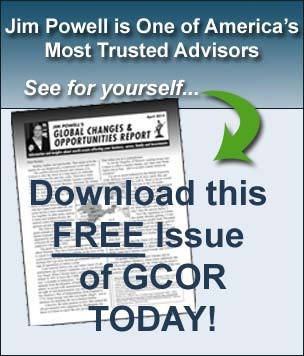 I run to the mailbox each month to get GCOR! Thanks for all you do." "Loving the newsletter Jim. Don't tell anyone, but it is my favorite of all we take. I mean it. If we had to only pick one letter, Martin and I both agreed that we would keep yours. It touches on so many important aspects of our lives and financial decisions." "Insights like that displayed in your June GCOR make it worth the subscription cost several times over in providing an interpretation of events pertinent to our lives and livelihood. This kind of insight is what a subscriber to this type of newsletter is looking for, please keep up the good work & thanks for a great newsletter."